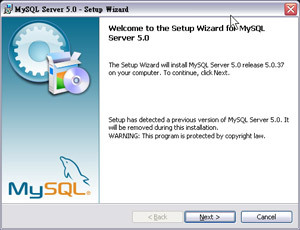 MySQL5 is not a necessary component for a Web server machine, but many web programs such as forum softwares use it. It is better to have one so you can make use of many free web programs on the internet. To work with MySQL5 for Windows, we strongly recommend You to use the PHP5 version of RaidenHTTPD, which can be downloaded from here. 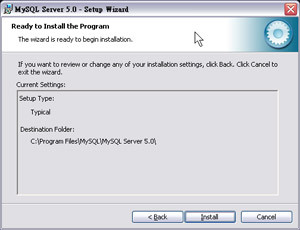 Please make sure to install to the c:\program files\mysql\mysql server 5.0\ , the default location. We'll use this path throughout the whole tutorial. Unless you know what you are doing, otherwise, please do not change it. Skip the sign-up, You probably don't need an account. 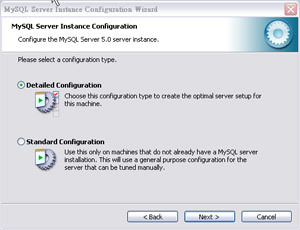 Check the checkbox for Configure the mysql server now. 4. 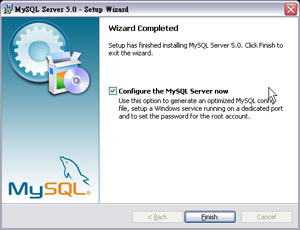 Now begin to configure MySQL 5. 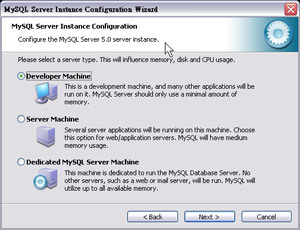 Select proper server type from developer (which may consumes fewer memory but lower performance) to server machine (balanced) or dedicated MySQL server machine (which uses more system resource but with best performance). multifunctional database: the most powerful choice. 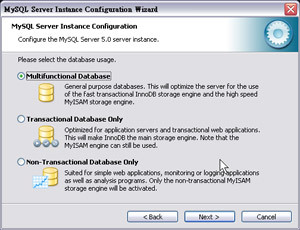 transactional database: supplies sql transactions capabilities through inno-db. 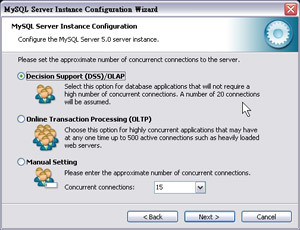 Select the expected max con-current connections. or Manual setting to specify Your own desired number. 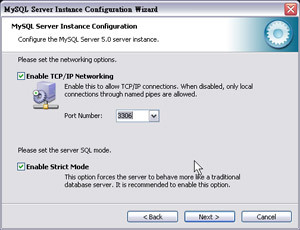 Enable MySQL server through the TCP/IP networking: this is probably a must have, and usually You do not need to change the default port for MySQL server, 3306. 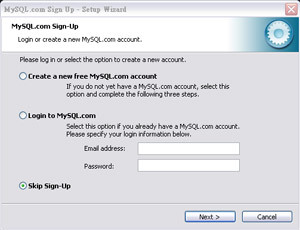 Make sure to configure Your Firewall and Router properly if You want to allow MySQL accesses from remote machines. 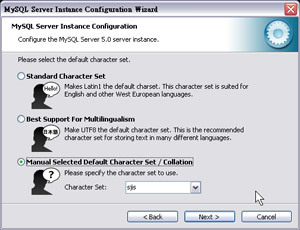 Select the default character set, for european or american users it is safe to use Standard character set or Best Support for multilingualism. 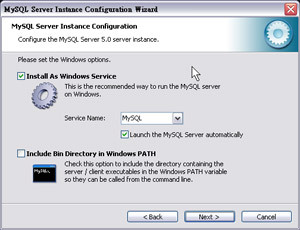 Specify the windows service name for MySQL 5 server, we recommend You to set it to MySQL5 to be distinguishable from other MySQL installations. Now here comes the most important part, set the password for Your root account, and You have to write this down. 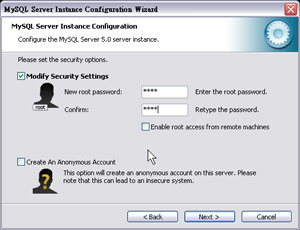 If You don't turn on enable root access from remote machines, You will be only able to connect to localhost MySQL Server. 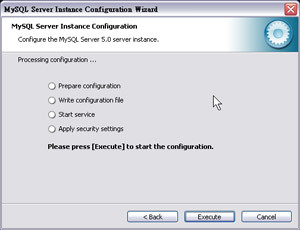 Click execute to finish the setup, remember that Your account is root, and Your password, and default MySQL server address is localhost and the port is TCP 3306.